Aftercharge [Chainawesome Games] – Ouch That Hertz! 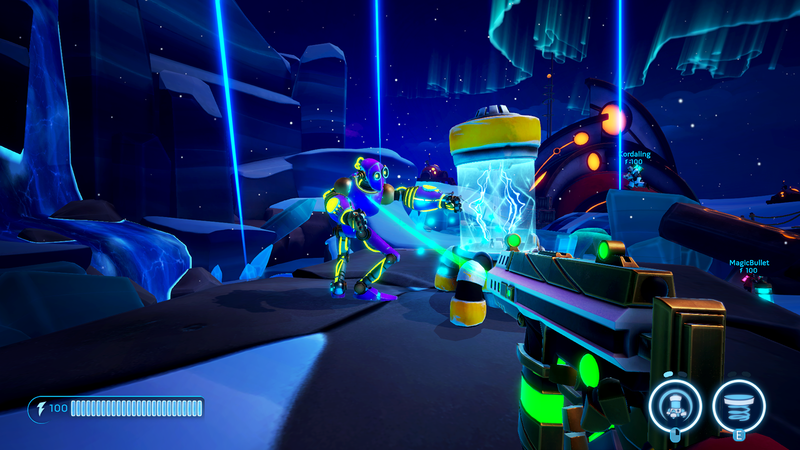 Aftercharge is a 3v3 PVP (player vs player) first person shooter developed by independent Canadian studio, Chainsawesome. As a huge fan of shooters, I have spent countless hours with the genre. With the success of games like Overwatch and Battleborn, it is no surprise developers are looking for ways to get a slice of that market. At first glance, Aftercharge looks like a legitimate candidate. A futuristic, cartoony art style highlighted with bright, neon accents makes for a pleasant visual setup. The retro synth music is also amusingly suiting. My first question was, “What makes it stand out?” After watching a couple preview videos on the store page, I was eager to get my feet wet. Did initial impressions met the expectations brought upon by the preview materials? Well the player will be greeted with a brief tutorial when they first launch the game. The objective seems simple enough, either attack or defend a handful of “energy extractors” sprinkled across a small map. Each team can choose from five robotic characters, all with their own unique abilities and traits. 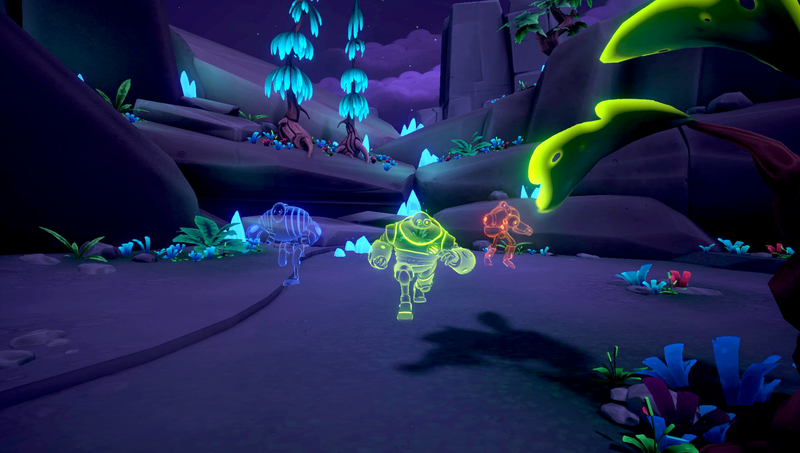 Aftercharge puts an interesting spin on the tried and true objective-based PVP shooter formula by including an invisibility mechanic. If the player’s team is designated to the Workonics (attack) team, they will have no firearm. This is offset by the fact the Workonics are given invisibility which only breaks when the attacker punches, or becomes “tracked.” We are not talking about Predator style, light-bending-around-you invisibility, either, this is full-on, One Ring invisibility. On the other side, The Enforcers (defend) team has firearms equipped with trackers which blink when they are near an opponent. Get close enough, and an arc of light projects from the weapon and reveals the enemy so they can promptly fill the opponent with lead. Having five character choices on either side gives the game a bit depth in allowing teams to formulate comps, but once a skirmish has started the choices are locked and cannot be changed. Workonics are tasked with destroying all extractors on the map while the Enforcers can down them with just a few hits. With limited defensive abilities outside of stealth, the Workonics team must juggle between damaging extractors, reviving teammates, and hiding from the opposition. Rather than having a set amount of lives, the Workonics team loses if all three members are down at the same time. Fortunately, revives are instant and limitless, so there is room for counter-play. Enforcers cannot be downed, but have a limited energy pool which is consumed by shooting and using abilities. They must stand next to an extractor to refill their pool. This mechanic prevents Enforcers from following Workonics around and continuously downing them when they are revived. Four maps add some diversity to the mix, though they are somewhat similar in structure. While they all have dark environments, the bright characters and sprites make the important things easy to spot. The menus are simple, clean, and easy to navigate. Standard graphics options are available, and the game runs smooth as butter on my modest rig. The 1920 x 1080 @ 60Hz max resolution may disappoint some, but this is obviously not a graphics-intense game. I had only one server option available, which was US-East even though I live in Arizona. Despite my 150ms ping, I did not notice any latency issues. The game has built in controller support and even voice chat. I could not help but notice the omission of a “profile” or “stats” page, which I found surprising. This means the only way the player can check their level progress is in the post game lobby. Unfortunately, the gameplay feels a bit slow. Given the invisibility mechanic’s central role, much of the game is spent chasing or running away from opponents. The slow movement speed almost makes it feel like the player is playing underwater. A few characters have mobility skills, but it is not enough to compensate for the general sluggishness of all movement. With very specific win conditions for either side, it seems vulnerable to cheesy strategies. I am confident I played with (mostly) bots, which did not have the best AI. There is no option to be matched with computer/human players, nor is there any indicator of which players are bots. I am interested to see what it is like playing with humans who are comfortable with the genre. As should be expected, there is a leveling system in which you earn rewards like colors for characters, and…oh wait, that’s it…There is an in-game currency which can be used to purchase music which plays when the player is downed and one purchasable skin for each character. Review copy provided by Chainawesome Games.